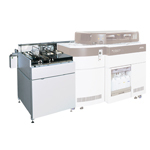 MALDI: JMS-S3000 Matrix-Assisted Laser Desorption/Ionization Time-of-Flight Mass Spectrometer | Products | JEOL Ltd. 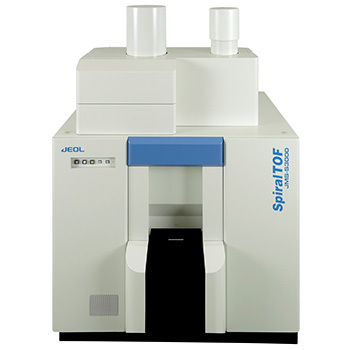 The JMS-S3000 is a MALDI-TOF MS incorporating JEOL’s unique SpiralTOF™ ion optic system. Featuring unprecedented levels of mass resolution and sensitivity, the system has been acknowledged for its distinctive capabilities in many scientific studies. The SpiralTOF™ ion optic system in the JMS-S3000 is superior to linear and reflectron ion optical systems. Utilizing the Perfect Focusing and Multi-Turn developed by Osaka University, the SpiralTOF™ ion optic system can focus ion packets per a given distance (a single layer of the spiral path). As a result, ion packets do not widen during flight and are focused at the detection surface when the length of flight is extended, achieving high mass resolution and accuracy as well as high ion detection efficiency. JEOL’s patented technology produced a spiral ion path 17 m long within a reasonable laboratory space. The spiral path is composed of 4 layered toroidal electrodes each incorporating 9 Matsuda plates inside its cylindrical electrode. Ions are accelerated to 20 kV in the ion source, and then pass through each layer of the 4 layered toroidal electrodes, reaching the detector. The JMS-S3000 compensates for a common problem with delayed extraction by using a conventional MALDI-TOF MS with an extended flight length, thus enhancing mass resolution and accuracy. The ion optic system of MALDI-TOF MS combines two ion optic systems, one using delayed extraction (length to focus position L1: red line) and the other having kinetic energy convergence (length L2: blue line). Delayed extraction, while contributing significantly to enhancing mass resolution of MALDI-TOF MS, has a flaw that the mass range where it achieves high resolution is localized. This problem is solved by increasing the L2/L1 ratio (ratio of the blue line). The JMS-S3000, where L2 is longer than in any conventional reflectron TOF MS by an order of magnitude, can analyze samples at high mass resolution and at high mass accuracy by internal reference. The JMS-S3000, by extending the length of flight, achieves high mass resolution and mass accuracy with an internal reference exceeding the levels in conventional MALDI-TOF in a wider mass range. The mass accuracy of ACTH fragment1-17 (m/z 2093) using an internal reference is 0.16 ppm. The unevenness of matrix crystallization results in different initial positions for laser irradiation, and consequently different lengths of flight. Although the difference is extremely small, in the conventional ion optic system, this difference in flight adversely affects mass resolution and mass accuracy using an external reference. The JMS-S3000, by extending the length of flight, minimizes this effect, stabilizing mass resolution and achieving high mass accuracy. 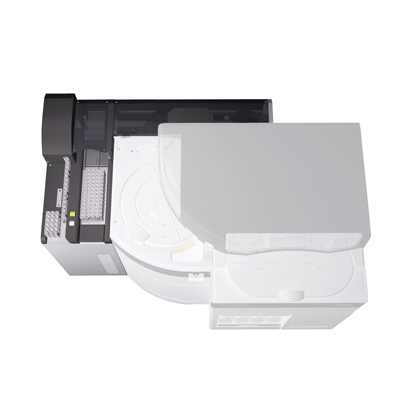 The JMS-S3000 can analyze samples at high mass accuracy by external reference. A standard peptide mixture and a trypsin digest of bovine serum albumin equal to 25 fmol were deposited in a calibration spot and sample spots of a standard target plate respectively. Spectra were acquired automatically, applied peak picking (deisotoped), and matched by MASCOT PMF by Matrix Science. 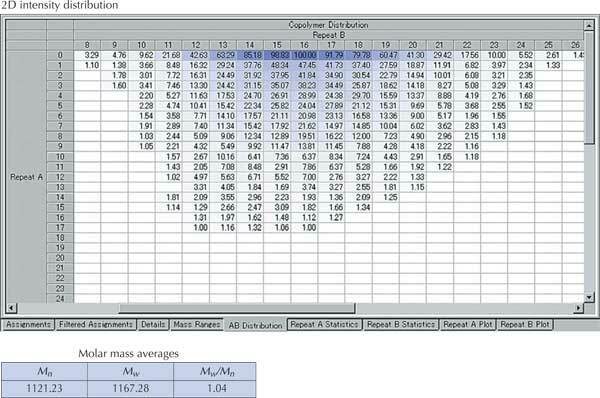 The table below shows the average mass error of peptide matched at each spot. JEOL offers an original target plate. 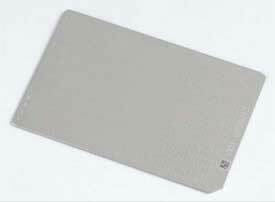 The target plate has 384 MTP sample spots and one calibration spot per 4 sample spots. A unique ID is assigned to each target plate. The system automatically identifies a target plate when it is loaded. The ID is saved with the data acquired.